Chinese Journal of Agricultural Biotechnology brings cutting-edge Chinese research to an international audience. The journal takes the very best papers published in Chinese in the Journal of Agricultural Biotechnology, translates them and makes them available to the international scientific community. Brought to you through a unique partnership between CABI Publishing and the China Agricultural University, the Chinese Journal of Agricultural Biotechnology will feature high quality Chinese research translated into English and presented alongside specially commissioned material to provide a wider context. 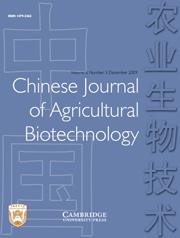 Chinese Journal of Agricultural Biotechnology will cover subjects such as biotechnology (cellular, chromosomal, enzymatic, genetic, and fermentation engineering) of agricultural plants, animals, and relevant microorganisms (including nitrogen fixing bacteria and pathogens), and related biochemistry and structural analysis.